Today I'd like to officially introduce you to maya*made's top sponsor: reCREATE. If you've been following along here for even a little while, you'll understand just how thrilled I am for us to mutually support one another. Our mission is to inspire creative expression through reuse. We believe in making art accessible to everyone and encourage people (especially children) to rediscover the value and potential in an every day item- like a toilet paper tube. Through doing so, each project is also a celebration as we divert items from entering landfills. reCREATE is a nonprofit organization that serves the greater Sacramento area (California's capital) through a hands on eco art center and a school program that will visit over 10,000 students this year! Drop in craft time for $5.00/hour - Craft with our bulk items, we will supply the scissors, glue, etc. Discussion about trash, natural resources, conservation, and personal choices in consumption and waste. A visit to the truck filled with our treasures (formerly known as trash), to fill their basket with good stuff. At reCREATE, we want everyone to believe that art is accessible, and to celebrate items being diverted from the waste system. Along with familiar recycled items, we receive some fascinating manufactured byproducts… like round foam circles, or rigid plastic containers, paper die cuts, or metal doodads. These are loaded with potential! Doesn't that all sound amazing!? Oh, how I wish Donna and reCREATE were in our little town! Details: We work with businesses to collect things they don't want, that we think have value in the creative process, and we use those materials to make our reCREATIONS. These are not mass produced kits, but rather, one of a kind activities packaged up for your creative enjoyment. 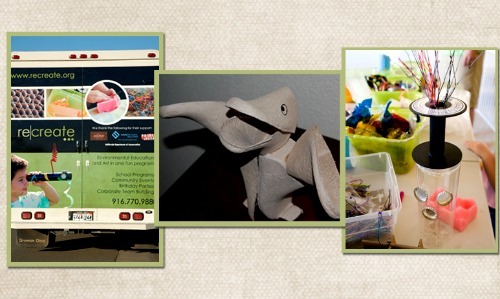 Our kits are meant to help you explore a hands-on, tactile art experience, as a family. All kit sales help us to expand the mission of reCREATE, which is to get people to downsize their waste footprint, and to promote art and creativity. There are currently three wonderful kits available online and more to come! So go check out the details right here. Thanks so much Donna and reCREATE! We're so glad you're here and are happy to spread your important message around the world! I live in the Sacramento Area and am so happy you featured reCREATE! I am looking forward to checking it out with my two kids. Thanks for the lovely spotlight Maya. We celebrated our One Year Anniversary for our Art Center this weekend. There are a handful of Creative Reuse Centers in the US... so I encourage your readers to google their region and see if they can find one!